Street fighting is serious business. At some point during a street fight, you'll likely find yourself on the ground with an opponent who's not going to stop until you're unconscious. Do you have the grappling skills needed to prevent this from happening to you? 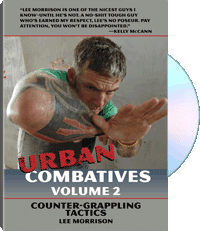 In volume two of this exclusive video series from Paladin Press, Urban Combatives instructor Lee Morrison reveals real-world tactics to shut down a threat quickly and violently . . . before it goes to the ground. Using ballistic manipulation, violence and speed, Lee teaches you gouging, ripping and biting tactics designed to stop a grappler cold. And if the fight does go to the ground, Lee demonstrates how to cover up and get back on your feet and in the fight fast. Unlike in the ring, there are no rules in a street fight, so you must do whatever it takes to overpower your opponent. Whether you are engaged in stand-up grappling or you find yourself on your back in an alley, you'll be ready with the counter-grappling tactics taught in this no-frills, survival-oriented video. For information purposes only.